This statistic presents average spending per U.S. online shopper per year in 2017, by retail type. 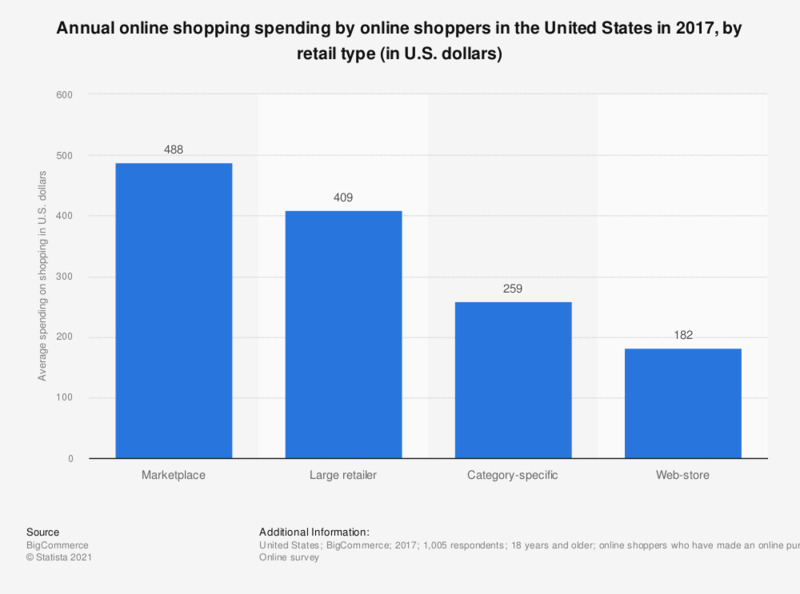 According to the findings, the retail type that had the highest average spending annually by U.S. online shoppers was marketplaces with an average recorded value of 488 U.S. dollars in annual spending per shopper. Marketplace: Online marketplaces selling a variety of items. Large brand name retailer: Legacy retailers with an omni-channel presence, meaning they have both brick-and-mortar locations and online storefronts. Web-store: These are small, online-only independent retailers. Category-specific online stores: These are large online retailers focused on a niche product offering. Everything On "Online marketplaces" in One Document: Edited and Divided into Handy Chapters. Including Detailed References. Which types of online shops do you prefer? Which of the following areas are the most important for you to gain insights into e-commerce marketplace path-to-purchase behavior? What do you usually pay per order when ordering food online? Have you ever sought a shop’s help or advice during the online shopping process? What do you usually pay per order when ordering electronic devices online? Which of the following seals of approval have you seen in online shops? Which of the following statements about online retailing do you agree with? When do you usually check which payment methods a given online shop accepts? Is there a payment method you do not use at all when shopping online? How many items does your usual order of books, music, or other media products comprise? Have you ever had any bad experiences with online shops? Which payment method do you prefer when shopping online? Which criteria are especially important to you when buying electronic devices online? Beside the product, are you satisfied with your shopping experience on an online C2C platform? Where and how did you look for product information before purchasing this product? When you tried to purchase goods and services from another EU country in the last 12 months, what was the result?